Why do you need to learn how to cut drywall? Drywall is a common product in most homes. From time to time repairs need to be made or drywall needs to be removed to repair other things. Another scenario might be making a home improvement. Finishing a basement or adding a closet will involve cutting drywall. Depending on the situation and the type of drywall the way you cut it can vary. 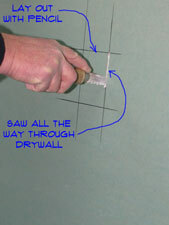 This article discusses the ways you can cut drywall with the tools you have at your disposal. For related drywall repair topics see the articles 'How To Fix Drywall', 'Patching Drywall', 'Repairing Large Holes in Drywall' and 'Taping and Mudding Drywall'. I do mention some special tools for completeness, but most homeowners will not possess them or have access to them. You do not need special tooling to cut drywall. They just make it faster when you do it all the time. The right tool for the cut you are making is also discussed. This article on how to cut drywall is informational. It is intended to provide basic how to skills to get a job done. We do not classify this information as a repair. We provide you with information about materials and techniques. The information below gives you a summary of the various things involved. Learning how to cut drywall depends a little on the type being cut. It is possible for you to have four or more different kinds of drywall in your home. Most of these types cut in a similar way. This is with the exception of cement board which is not really drywall at all. This material is used in bathrooms because it does not rot. Knowing the types will help you when you learn how to cut drywall. 1/2" Regular Drywall - This is probably the most common type you will find. It is used on most of the walls and ceilings. It is made of a gypsum core sandwiched between two layers of heavy papers. This type is the easiest of all to cut. 5/8" Firecode Drywall - This drywall is thicker than the half inch material. It also has a special gypsum core that resists heat and provides fire protection. The heavier fibrous core is harder to cut but still possible. Moisture Resistant Drywall - As the name implies this drywall is used for areas like bathrooms that have higher humidity. Sometimes called green board (it comes in different colors now depending on the manufacturer), it is in between regular and firecode for difficulty. Glass Mat Drywall - This drywall is a variation of moisture resistant drywall. With the prevalence of mold issues, glass mat drywall was developed to eliminate mold growth on the drywall. The facing is made of fiberglass instead of paper. Mold will not grow without organic material present. You may find some of this drywall in a newer home. Cement Board - A further step in moisture resistance. This is not drywall at all (drywall is made of gypsum, cement board has no gypsum in it).It is made by sandwiching a special cement core between two layers of fiberglass mat. This material is used behind ceramic tile and marble for high moisture areas. This material is the hardest of all to cut. The types of drywall listed above may be found in your home. Many homes only have one or two kinds. Don't be shocked if you find something you are not familiar with. The cutting methods below will tell you which methods are appropriate. In addition we will discuss which tools to use for each cut. Learning how to cut drywall is not that difficult when you know a few tricks. Using a utility knife to cut drywall is the your first choice. The drywall has a paper facing on it, that the utility knife is well suited to cut. The first thing you will need to do when you cut drywall is to size the piece. A tape measure and utility knife are the tools for this. For a patch where you are fitting into a cut out you want to size the piece 1/8" to 1/4" smaller than the hole you are filling. Get your measurements for the piece first. If you want use that old carpenter rule, measure twice, cut once. To begin your cut you score the paper on the face side of the drywall. For a piece that is close to four feet wide you want to cut clear across the four foot dimension of the drywall. After you have done that you break the piece back and cut the paper on the back side. Repeat this step to size the piece the other way. 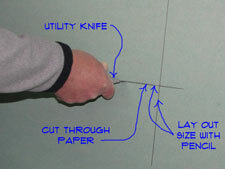 Keeping cuts straight when using a utility knife to cut drywall can be challenging. How do you do it? Great question. There are a couple of ways to do that. You can draw a line on the face layer with a straight edge and a pencil. Then you carefully follow the line with the utility knife. The next option would be to mark the sheet and then use a metal straight edge or a tee square to guide the blade. See the article 'Using a Drywall Tee Square'. Another very effective method is the one used by professional drywall hangers. You hold the end of the utility knife against the end of the tape measure and hold it in place with your thumb and forefinger. Then you pinch the tape measure at the correct dimension with your other thumb and forefinger. You run you finger along the edge of the drywall and score the board at the same time. You need to keep the tape more or less perpendicular to the side you are measuring from. This method requires some practice and may not be practical to learn if you only have one or two pieces to cut. Want to try it? Use some scrap pieces to develop your skills. When you are cutting a small piece out of a larger sheet you will need to use the keyhole saw (discussed below). Cut the drywall with the keyhole saw in one direction and score it and break it in the other one. Using a drywall keyhole saw for cutting out boxes and openings is common. A keyhole saw as the name implies cuts drywall by sawing it. It has a sharp point that can be bored through the drywall to start a hole. Once the saw is through the drywall you saw along the line. At times you can use a keyhole saw to cut in from the edge of a sheet. Another thing a keyhole saw is good for is cutting out an opening. Electrical boxes or light fixtures are a good example. You need to measure from the edges that the drywall piece will abut to. Lay out the opening on the new piece of drywall. With the lines in place you can cut out the opening using a drywall keyhole saw. Use the point to bore into the drywall. Saw the opening out from there. Some pieces of drywall may need several things cut out of them. Bathrooms and kitchens are examples of this. Using a drywall keyhole saw is a must at these locations. When available, using a drywall tee square to cut drywall is a time saver. A tee square as the name implies looks like a tee. It is designed to provide a guide for cutting long sheets of drywall to the desired lengths. The long leg on the tee square is four feet long. The tee at the top aligns with the long edge of the drywall. 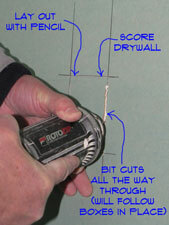 The self squaring feature gives you a good edge to cut the drywall along. Use your knife or a pencil to mark the desired length of the piece you need. Position the tee square at the mark. 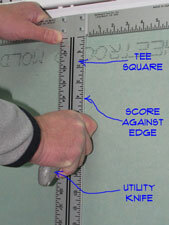 Use hands, knees and feet to hold the tee square in place while you run the utility knife along it. Snap the drywall and score the back to complete the cut. Using a drywall tee square as a straight edge to make smaller cuts also makes sense. A tee square is not a big investment, around $20. Weigh the cost against how often you will likely use it. Are you in this home repair thing for the long haul? It might be worth the investment. Cutting drywall with a router can save time and improve the quality of the installation. One note of caution, they generate a lot of dust and can require a lot of clean up. Drywall routers are not quite the same as a router you may have in your wood shop. They are similar to a laminate router that is a specialized tool. Standard drywall router bits require an eighth inch shank. Heavy duty bits may be a quarter inch shank. The point is that a standard router is not set up to act as a drywall router. When you get down to the nitty gritty, a standard router might be converted to a drywall configuration. That is beyond the scope of this article. It is possible but not practical. Instead of cutting drywall with a router, I recommend using more conventional cutting techniques for simple repairs. Drywall routers will cut around an opening when the drywall is in place. When you use a router to cut an opening you first mark and approximate center of the opening on the drywall. Then you tack the sheet in place. Push the router through the drywall at the mark. Move laterally to the edge of the opening. For an electrical box or light fixture, you jump to the outside of the rim and follow the edge counterclockwise. For a plain cut out you follow the inside of the opening with the router. Make sure you push the wires back into the box before routing the drywall. You can also use the router to cut out opening on a sheet before you put it in place. This takes some practice as the router cuts the board easily and does better when it has something to follow. Some drywall hangers score the drywall and the router will track in the groove. Most homeowners do not have a drywall router and it is probably not worth purchasing one for a small project. Got a tool fetish, you can own one of these high powered babies for around $75. With a little creativity you can even manage to justify it to your spouse. Learning how to cut cement board is important if you have a bathroom remodeling project. Can you cut cement board with a utility knife? That is a $64,000 question. The answer is yes, but it is not fun. As mentioned above cement board is two fiberglass mats with a cement core. You and use a utility knife to score the fiberglass. You have to score it several times and the blade will have a tendency to jump out of the groove. With the fiberglass mat scored the cement board will break similar to drywall. The problem is that it does not break cleanly or pretty for that matter. Sometimes hunks will break free that are not anywhere near the line that you scored. A much better choice is a diamond circular saw blade. Cut the cement board the same way you would cut plywood. Do it outside or in the garage. Cutting it dry with a diamond blade will generate a lot of dust. Wear a mask. Cutting drywall for you home repair projects should not be a big problem. A few tools and a couple of tricks and you are in business. Not really rocket science and since you are taping over it, it is forgiving. Are you glad that you learned how to cut drywall? Maybe 'glad' isn't the right word. How about satisfied? Is that a better word? All right let's concede that it would not be your first choice for a fulfilling experience. You do have to admit, however, that it did save you a few bucks.